The Academy Awards are this weekend. We are big on award shows around here and the first step in any award show party planning is to find the right ballot. 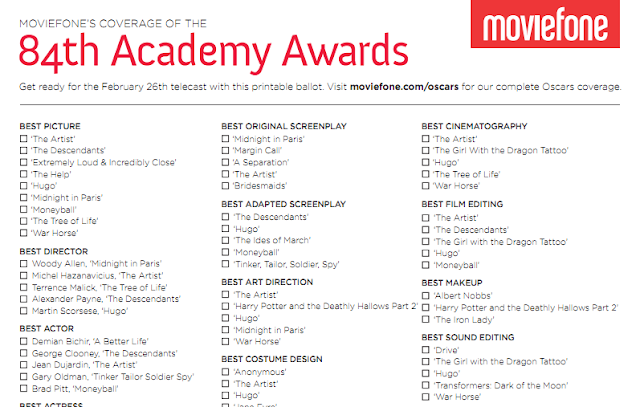 I haven't found an 'official ballot' for the Oscars, but there are a ton of other options to choose from. 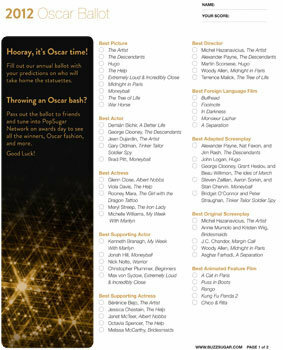 Moviefone has put out a printable Oscar ballot that is clean and simple to print. Not too many colors so it won't kill your ink cartridge when you print them out ahead of time for all of your guests. Buzz Sugar has one that is a printable Academy Awards ballot that is a little more glamorous. And if you want to create one of your own, or just study up on the nominees so that you can make better predictions, you can check out the 2012 Oscar nominees over at the official Oscar site. And for the rest of the party, you can check out other Oscar Party Ideas HERE. This will be the conversation starter for my dinner party tonight. Thanks for posting.